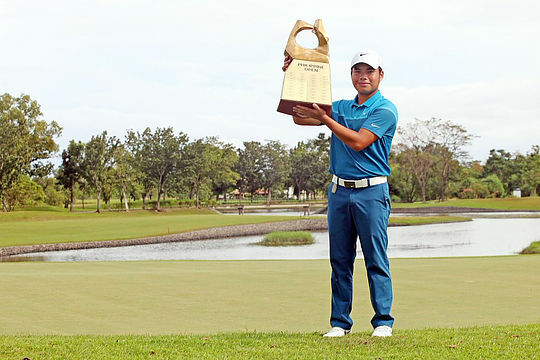 Miguel Tabuena of the Philippines fired a superb six-under-par 66 to claim a stylish win at the Philippine Open for his first Asian Tour title on Sunday. The 21-year-old fired six birdies on his homeward nine to seal the deal with a winning total of 14-under-par 202 in the US$300,000 Asian Tour event which was reduced to 54 holes due to bad weather earlier this week. India’s Himmat Rai produced the round of the week at the Luisita Golf and Country Club with a sparkling 63 to share third place with Chinnarat Phadungsil (67) of Thailand on 204, two shots from the champion. Lindsay Renolds of Canada, who held the lead in the opening two rounds, fired a disappointing 73 to finish in tied 10th place in the final Asian Tour event in 2015. “You have to take your defeats as a positive and remind yourself that it is part of the process. It definitely made me a stronger golfer mentally. It helped a lot that I had already saved my Asian Tour card for 2016 earlier this year. I knew I was playing for the win. “I played really well here before and I won on this course on the local circuit. I’m without words really. I’m happy and glad with the victory,” said Tabuena. Australia’s Scott Barr retained his Asian Tour card for the 12th straight season after finishing one-shot behind Tabuena. He was in a good position to pip Tabuena to the title but let the chance slip when he bogeyed 17 after finding water. A birdie on the last earned him his best result since 2006. “I couldn’t hole any putts for 14 holes. Once I did, it was game on and I holed my share. I did what I needed to do but it is a shame to finish one short. This week is a huge positive. I set very low expectations coming into the week but it is great that I’ve secured my card,” he said. Other players who safely retained their Asian Tour cards include Unho Park of Australia (63rd), Chawalit Plaphol of Thailand (62nd), Adam Groom of Australia (61st) and Lu Wei-chih of Chinese Taipei (60th).